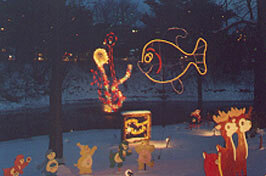 Each holiday season presents a perfect opportunity for special light displays. Communities across Ontario are joining the festive mood by presenting variations on the theme. Owen Sound's Festival of Northern Lights is one of the best in the Province. The Niagara Escarpment provides a natural backdrop for the community that has all the ingredients necessary for a unique and colourful festival. Owen Sounds bills itself as the Christmas capital of Ontario's Sunshine Coast. The city has always been a major shipping, fishing and pleasure craft port. Its protected harbour is home to Ontario Northland Ferries that traverse Georgian Bay between Manitoulin Island and the "Sound". The Chi-Cheemaun, meaning Big Canoe, docks at Owen Sound for the winter. Strung with lights the ship provides a perfect backdrop for downtown festival activities, as do the bridges that cross the Sydenham River. Snow comes early to Owen Sound. Sweeping off Lake Huron and Georgian Bay, weather systems dump centimetres on the city before moving inland. The Festival of Northern Lights takes full advantage of winter's frosty bounty. There is nothing more beautiful than thousands of twinkling lights playing off sparkling drifts of snow. In the spirit of the season, everyone is encouraged to participate in old- fashioned winter activities that have become an integral part of the festival. To make the festival happen, behind-the-scenes work bees continue year-round as volunteers check each display and refurbishing those that need it. New displays are designed and added each year. The harbour and banks of the Sydenham River, which meanders through the city, are focal points for more than 200 displays, as is Harrison Park in its pristine location at the foot of the escarpment. In Y2001 there will be more than thirteen kilometres of light-strings on creative displays and surrounding trees. City residents get into the spirit of the festival by lavishly decorating their homes and businesses. Owen Sound's festival was the brainchild of Marie Walpole who started the process in 1987. Since then it has grown to become one of the most visited events in Ontario. Displays, designed as eye-treats during the day, are spectacular when night descends on the Sound. When switches are thrown at dusk, a magical kingdom appears along both sides of the river and throughout Harrison Park. Sophisticated displays twinkle with thousands of lights. Some are static. Others animated. Quite a few provide musical accompaniment. Displays range from popular cartoon characters through whimsical fantasies, historical tableaus and religious themes. They can be viewed from your car, but the best way to enjoy the show is to walk throughout the main area, then drive along decorated streets to Harrison Park's displays. Although each of the eight weekends during the festival provides entertainment, there are two that stand out as unique. Opening Ceremonies weekend in mid-November is full of interesting events, beginning with a Torchlight parade on Friday evening which winds its way to downtown Queen's Park Bandshell. The venue includes live theatre, crafts shows, the M.S. Chi-Cheemaun Christmas Open House, House Tours, turkey dinners, carolers, street musicians, characters in Victorian Dress and the famous Santa Claus Parade. The Last weekend in November is special for children of all ages. 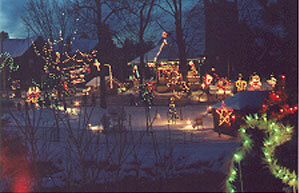 Along with the miles of special displays, Harrison Park is transformed into Santa's Village for "Festival In The Park". Children enjoy Reindeer Games and a Scavenger Hunt. Mrs. Claus' kitchen is set up to decorate cookies and create-a-craft. Stage entertainments are fun for everyone. Choirs showcase their talent while carolers roam throughout the park. Penny carnival and a colour contest are popular.. Toast your toes at a warm fire or try your hand at cooking up some bannock-on-a-stick. DayCamp's famous Rocky Road bannock is the best! There is ice sculpturing, a demonstration on constructing an igloo and Frosty's Forest. The North Pole Express, a horse drawn hayride, takes visitors on a merry tour around the park. Kris Kringle's Cottage is nestled deep in the woods, replete with Santa who is ready to hear everyone's wishes. Santa's Cinema entertains with a classic from 5:00 p.m. -7:00 p.m. with fresh buttered popcorn and holiday punch close at hand. Reasonably priced food is available from area service clubs. Bring your toboggan. Harrison Park has a wonderful hill. A climb is challenging but the view from the top is magnificent. It is your choice how far up you wish to go. Remember what goes up, comes down quickly and wants to go up again. The ride is exhilarating! If tobogganing is too aggressive for old bones, hike the many trails throughout the park. Routes lead to deer, swan and geese compounds. The park has a great display of live pheasants housed in large comfortable quarters. Watch for the tame bunnies that love to mingle with visitors near the bird pens. Harrison Park Inn with its crackling fire, huge windows and wood interior is a great place to passively enjoy park activity. Hill climbers fortify themselves with pie and hot chocolate. Hardy appetites find lots on the menus to fill big tummies. To be on the safe side, make reservations if planning to eat supper in the park. 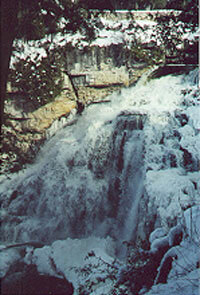 Don't forget to see Inglis Falls which is located one mile from Harrison Park. Signage is easy to follow. Water tumbling over the Niagara Escarpment into the Sydenham River, makes one of the most spectacular falls in Ontario. It is especially beautiful in wintertime with icicles and frozen ice-bridges. Viewing areas are set up at Inglis Falls. Please be careful and do not attempt to climb down slippery rocks to the base of the cascade. The view of the Bruce Peninsula and Georgian Bay from the bridge above the falls is magical, especially on a bright day under a mantle of snow. Plan to stay overnight to participate in all area activities. Accommodation is plentiful. Spend Saturday evening at the restored Roxy Theatre, that each year provides quality entertainment at reasonable prices during Festival season. A number of churches also hold special theatrical and musical events. A list is available at Owen Sound Tourism. Getting to Owen Sound is half the fun. As your vehicle climbs toward Georgian Bay and Lake Huron, the landscape changes from flat farm-scape to the more rugged escarpment terrain of rolling hills, cedar bush and limestone outcrop. For the last few miles, you drive the old Garafraxa Road, "Garafraxa" meaning "wild panther". Of course today it is a modern highway, nothing like the wilderness trail of one hundred and seventy years ago. From mid-November until mid-January thousands of people make the trip. The key to enjoying the Festival of Northern Lights is to dress, warmly and let the child inside you escape for a magical interlude in the snow. Don't forget your camera. Bring a hearty appetite and be prepared for a wondrous weekend.